Halloween costumes for dogs have become very popular these days. 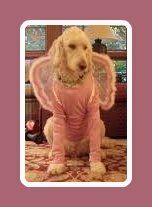 Halloween can be a really fun time for the entire family to dress up even for your dog, well some dogs. Some dogs even look like they enjoy getting dressed in a Halloween costume, while others can become scared or uncomfortable in clothing of any type. So be aware of what makes him happy. Never cover your dogs face or mouth and make sure the Halloween Costume for your dog isn't too long or big that would get in the way of your dog being able to walk comfortably and go potty. Make sure when you are chooseing Halloween Costumes for Dogs that they fit comfortably. If they are too tight, it could cut off circulation or even cause sores to develop. When putting on Halloween Costumes for Dogs, start simple and see how he handles it. And NEVER leave your dog unattended with a costume on because he could get injured or may ingest parts of the costume and choke. If he doesn't like it, then don't push the issue of dressing up. Maybe you could use a cute bandanna, scarf, collar or other simple item instead. Scary! There are many potentially dangerous things and sources of stress out there to your dog that you need to watch out for. Things like scary, moving displays, blowing smoke machines or loud crashes or screaming. Being prepared will make the night go smoothly for everyone. 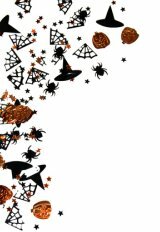 While it may seem a great idea to take your dog out with you trick-or-treating you need to realize that there are so many dangers that he can and will find on the ground that could seriously hurt your dogs. Always keep your dog on a leash, have current tags and up to date with shots! You may even want to take a supply of homemade pumpkin dog treats to hand out to other Halloween dogs you know in the neighborhood. But always ask before giving a dog treat out. What are some of the dangers that your dog can encounter during Halloween? Halloween Candy - especially chocolate is extremely toxic to your dog. Chocolate contains theobromine. A naturally occurring stimulant found in the cocoa bean, theobromine increases urination and affects the central nervous system as well as heart muscle. While amounts vary by type of chocolate, it's the theobromine that is poisonous to dogs. Some people ask "How much is too much as far as chocolate goes?" That's not a simple question to answer because of the various things that need to be considered. The weight of the dog, along with health and age vary. And because there many types of chocolate, it would be hard to say how much is too much. So my standard answer is this: "don't ever let a dog have any type or amount of chocolate, period!" Especially since during Halloween dogs would be exposed to huge amounts of chocolate, you really need to be careful at home and if your taking your dog out with you trick-or-treating with the kids. Also, artificially sweetened candy, gum and other goodies may also contain xylitol, which is a highly toxic substance for dogs. You also need to be careful that your dog doesn't eat food wrappers or lollipop sticks which can cause a risk of choking, upset stomach or gastrointestinal blockage. While your out walking with your dogs, they will be very curious about any new objects they find along the way either on the ground or just walking by a display. Things like ittsy bitsy plastic spiders, small pieces of glow sticks, sequins, or any other type of decorations. You really have to be watching very carefully what your dogs are doing. Although many dogs are very social and love people, Halloween night can be very stressful and scary for them. Because of all the different types of kids and adult costumes, including Halloween Costumes for Dogs, flickering lights, screaming kids, tons of people walking and different Haunted House noises, dogs can become very stressed out. Especially young dogs or puppies or older dogs. If your staying in but will be greeting the little goblins at the door, you may find that the constant ringing of the doorbell might get your dog over-excited or very stressed out. You might want to consider keeping your dog at a distance either by using some type of gate between him and the door or perhaps confining your dogs to another area of the house. If your dog seems afraid of kids in Halloween costumes, remove him from the situation calmly and never insist that he "make friends". If your dogs are scarred, their scarred period! Don't push the situation. On a side note: Every year it's so very sad to see people insisting on taking their puppies, skittish or old dogs up into a Haunted House type of situation or some other loud unexpected noise. These poor dogs are scarred to death, pulling to get away, whining and just begging to be taken out of the situation! But no, their owners find it funny and drag the poor dogs in! It drives me crazy! Please don't do that. 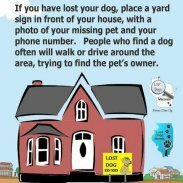 Think about your dog, they depend on you, their pack leader , to direct them into safe places. During this time of year, I personally feel that all dogs should be kept inside and not left out in the yard unsupervised. Sadly, there are some really cruel, sick minded people out there who find it funny to mess with dogs in all sorts of scary, dangerous and even deadly ways. It is a known fact that Black Cats are targeted during Halloween for sacrifices and/or used to mutilate and leave a poor kitty half alive to die. Sorry, but this is a true fact of life. All household pets are at risk this time of year, so just keep them inside safe and cozy. Check out some of these really cute Halloween Costumes for dogs!